A kitchen is one of the most valuable aspects of a home, bringing family and friends together over a warm meal and instilling valuable lessons of cooking and cleaning in our young ones. Without enough space to store all the needed cooking tools, however, this part of the home can quickly become a cluttered, frustrating mess. 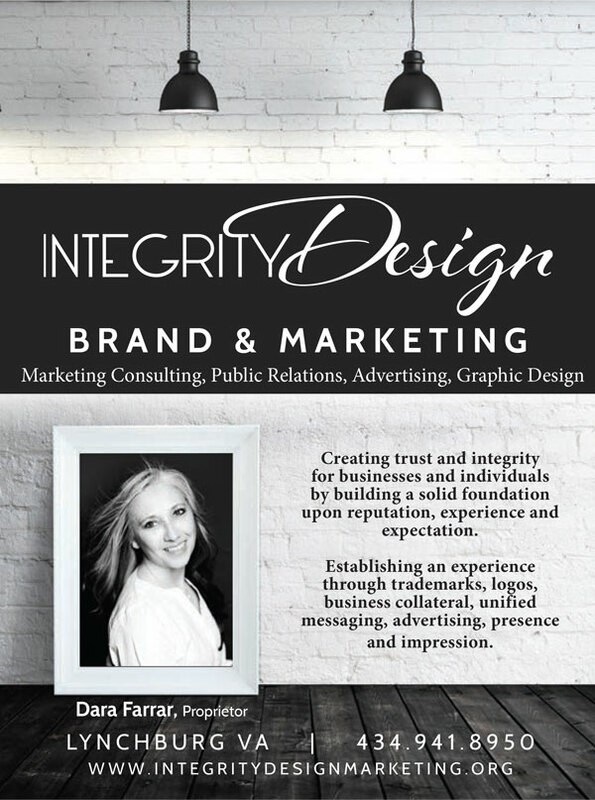 To avoid the clutter, you don’t need to do an expensive renovation. Here are a few tips and tricks to utilize uninhabited space, looking up, down and straight ahead in the kitchen to turn it into an organized sanctuary for the everyday cooks and connoisseurs. The space above cabinets is often unused, but can easily handle functional wire baskets filled with items which aren’t used daily. Fancy silverware that only comes out for guests and small appliances which gather dust in your cabinets can be stored high, out of sight. Labeling baskets makes it easy to find items stored there quickly. There is often a large gap above the fridge which goes unutilized. Consider using freestanding shelves or wall-mounted cubbies on the fridge top, or floating shelves mounted on the wall. 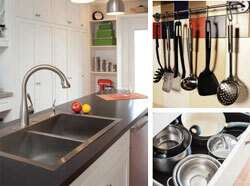 Larger appliances which don’t get used daily—think crockpots and mixers—can find a home in this customized space. Do you have a breakfast nook? If so, the area under the outcropped table is a perfect space for small, mounted cubbies, just the right size for cookbooks, magazines and linens, but small enough so as not to knock the knees of diners. Looking down lower, if kitchen cabinets stop shy of the floor, toe-kick drawers are helpful. These small drawers are designed to utilize the snug space under your drawers, at toe level. Short and stocky, they allow complete utilization of small recesses while creating a snug home for small pantry items or stacks of flat pans and cookware. For a nontraditional take on kitchen storage, consider ditching the typical dining table and chairs for a built-in corner booth. Also known as a banquette, this piece adds seating while utilizing an otherwise unused corner of space. The most significant advantage to a handcrafted banquette is the massive storage space freed up under the banquette’s cushions. By creating a simple wooden-box booth with a hinged top, the kitchen gains hidden storage for bulky items cluttering cabinets and pantry. Add freestanding shelves for even more storage space! Drawers at waist level are often the easiest to reach; therefore, they tend to become the most disorganized. Drawers can quickly be cluttered by large utensils, bulky potato mashers and pesky cheese graters just waiting to slice and shred searching hands. Eliminate jumbled serveware by hanging them on S-hooks along a tension rod inside a window, or even over the stove if there is no range. If the look of a tension rod is not appealing, install wall hooks to any area of free space under, inside, or alongside cabinets. If disheveled drawers are the bane of your existence, don’t forget the Lazy Susan; these turntables make items easily accessible in the most awkward of spaces. That recessed cabinet corner is no match for a Lazy Susan, which can organize a variety of items, then spin them to the front so they don’t get lost in the corners. Make your own DIY Lazy Susan by sandwiching a layer of marbles between two cake pans! 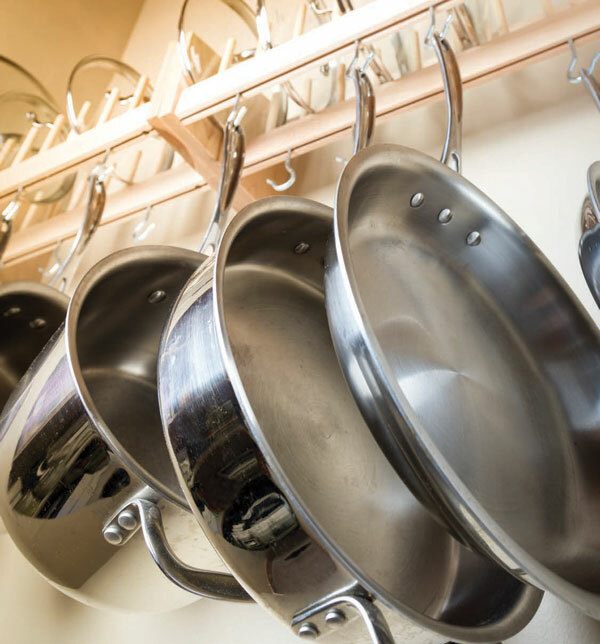 Oh, the dreaded mountains of pots and pans, those towers of precisely stacked metal which beg to crash in a clanging avalanche at every cabinet opening: to avoid that ear-shattering mess, use shelf risers or a freestanding pot rack. Nest smaller pots under the shelf risers and stack larger pots on top. The same method can be used to neatly store large and small plates, as well as large and small bowls. 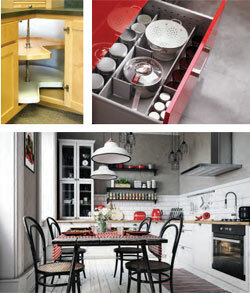 Using these versatile tools allows you to gain twice as much space from each cabinet. What about that awkward space between the fridge and wall? Consider using that space for a slender shelving system—a stroke of genius that turns that small, dusty space into a perfect home for cans, spices and more. If you are pining for a pantry and are a DIY enthusiast, build shelves recessed into the wall between studs. These retracted shelves add convenient storage without taking up valuable floor space.